I decided with this new EV I was going to try to design a 4+KW charger. While I am going to get a 2KW Elcon charger for the CALB 180 Ah, I wanted to build something with more kick and compatibility with the J1772 charging stations. Over the past few months I've been gathering parts and now I'm ready to assemble then program the charger. I've purchased a lot of new parts, but I salvaged the inductor from my old broken K&W BC-20. This charger is partly based on the 10 KW Open Source EV charger from DIYElectricCar.com Forum, but I've added some of my own features and changes. 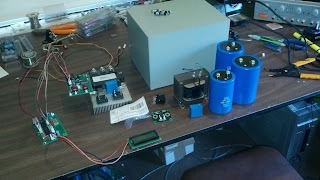 The first version will be 4 KW, and once that works well I am going to bump it up to 6 KW. I will probably build it for 10 KW, but I don't have access to that kind of power. Now that I have free time I have started to really get things going. I have orders a new 5 stage clutch and lightweight flywheel, 25 ft of new 2/0 battery cable and tomorrow I am going to pickup a new hood latch and release cable. I have to be able to easily open the hood before converting it so might as well start there. I also have to replace the rear suspension. I am also ready to order the CALB batteries, once some purchase order paperwork is in the computer system. Once that is done, I'll have 45 180 AH blue CALB cells waiting for an EV! I told my self I wouldn't start the actual conversion until I had everything, so I'm going through my list and ordering what I need.